Alto Sax. Arranged by Various. 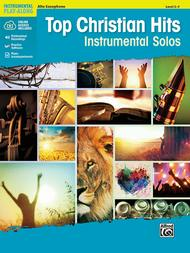 Instrumental Series; Other Church; Play-Along; Worship Resources. Top Hits Instrumental Solos Series. Contemporary Christian; Pop; Sacred. Book; CD. 32 pages. Alfred Music #00-46789. Published by Alfred Music (AP.46789).